I decided to break up drama recapping, reviews, and my random character learning with my attempt at Asian cooking (definitely no where near AUTHENTIC Asian cooking, but the Americanized lazy version). 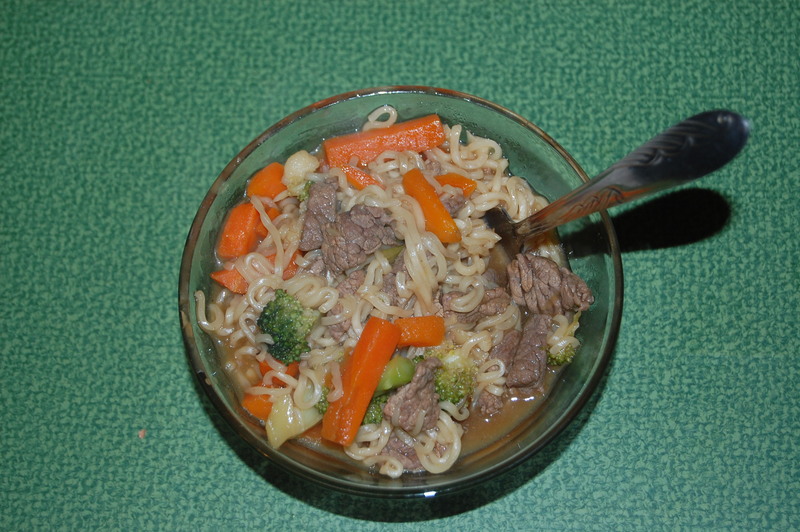 So here we are with a Teriyaki Beef Noodle Bowl (which needed WAY more noodles than a single package of Ramen provides). Fry beef until browned. Add the adobo seasoning (however much you deem necessary) and half the Ramen seasoning mix along with 1 and 1/2 cups of water. Bring to a boil and add the rest of the Ramen seasoning, the noodles (they say to break into 4 pieces, but that makes the noodles too small), and the still frozen veggie mix (don’t steam the vegetables first!). Then you just cook those until the noodles are tender and the veggies are completely unthawed and cooked all the way through. All in all, it takes like 20 minutes or so. Not anywhere near authentic, but it works when you are craving Asian-style food.